Start talking about EME ("Earth-Moon-Earth") or "Moon Bounce" and any ham with a few years experience will have starry-eyed visions of a massive array of yagi antennas mounted on precision rotors tracking the sky. But when it comes to weak-signal work these days, cheap computer processors and even cheaper sound cards carry the bulk of the workload, leaving antennas smaller and power amps lighter. Then there is an added bonus: software originally written to decode the weakest of signals in a sea of mud can be used by almost anyone to make terrestrial contacts which before were practically impossible. 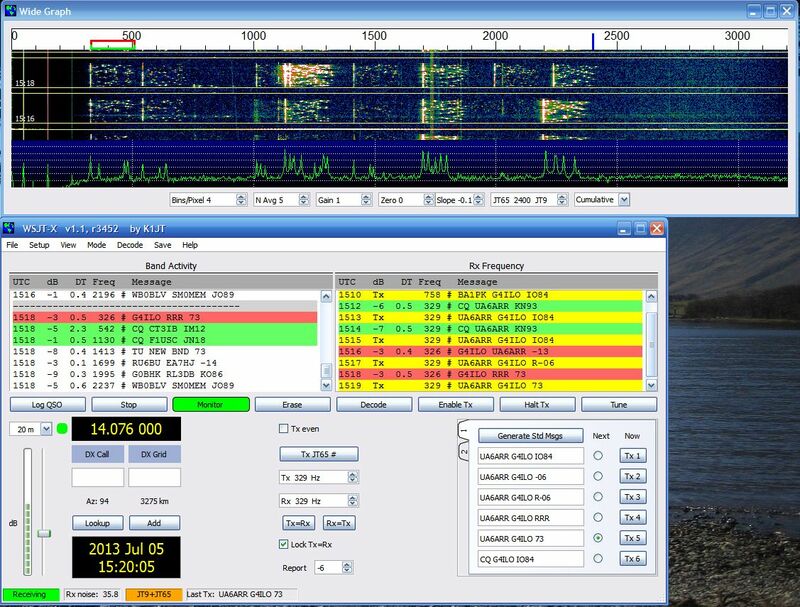 The most popular mode is called JT65 and is available in a variety of software packages. For non-EME operators, the most popular is JT65-HF (along with its narrower companion mode, JT9) and can be worked by running software downloaded from Sourceforge or WSJT's website. There is also a video tutorial on how to install and run the Sourceforge program. The ARRL also has a good JT65 primmer including several links and instructions for getting started. Once you have it installed and running, get ready to SLOW DOWN. JT65 is like working a sloth on CW. QSOs consist of a standard series of exchanges, each lasting 47 seconds. Each exchange starts at the top of the minute. That means each QSO will last as least five to six minutes, maybe longer if the band conditions are poor. For some of us (like me with a couple of young kids running around yelling) the slow pace is really enjoyable. I sometimes even do other things while the QSO is in progress. Even though it is appropriately called JT65-HF, it can be done on SSB on VFH and UHF frequencies. Keith (KN5G) found a great website that has an ongoing "chat" of people who work JT65 terrestrially (there are also links on the same page for our EME friends).